The kitchen is a tricky place to paint because there are often several different surfaces to cover. Your walls, ceilings, cabinets, and your doors might require different types of paint. Then there are all the items and common kitchen inhabitants that will affect the décor and feel of the room after you’ve painted. You’ll have to match your wall and ceiling paint with your kitchen appliances, cabinets, drawers, and maybe your kitchen table, too. So there are many things to consider when choosing a paint for your kitchen interior. If you cook often (or at all) you should consider paint finishes that are easy to clean, and will hold up better against mildew and mold in some cases. In Colorado, you don’t have to worry so much about mold, but there is a higher risk of it developing in your kitchen or bathroom, where the air and surfaces tend to be moister for longer periods of time. Let’s take a look at some painting options and a few concerns to think about when you break out the rollers and the fresh paint for your kitchen project. Which Paint Finish Works Best in the Kitchen? Most interior painting experts would agree that there are really only two choices for kitchen paint finish: satin or semi-gloss. All paints you see in the store offer you a range of finish choices from flat to high-gloss. The more on the matte side the finish, the more difficult it will be to clean, the more on the gloss side the finish, the easier it will be to clean. Chances are, you occasionally get foodstuffs on the wall (an understatement if you have kids), so you want to be able to clean that off with soap and water. The higher the gloss, the shinier and easier to clean the wall will be. Satin finishes are often used interchangeably with eggshell finishes but satin is usually shinier. Satin finishes work well in the kitchen because they dry soft, almost silky, and the resist mildew, mold, dirt, and stains. Semi-gloss finishes have more of a shine to it than satin. Glossy finishes reflect a good deal of light without blinding you. It, too, is easy to clean, but it resists water better than satin finishes. 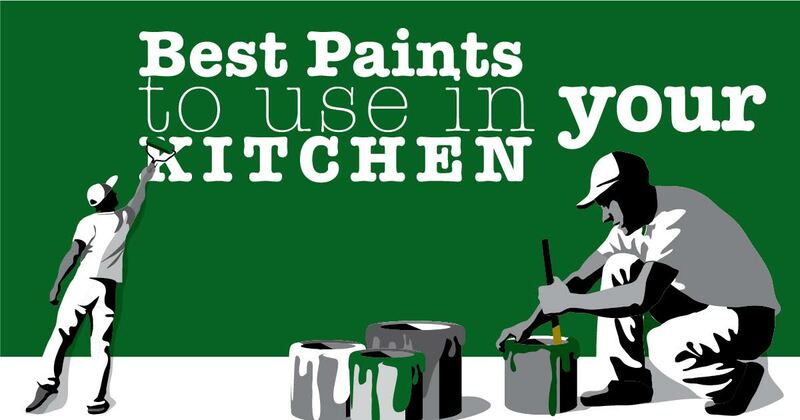 Choosing oil or latex paint for your kitchen depends on the surfaces you plan to paint. If you want to only paint your kitchen walls, stick with latex with a glossy or satin finish. Oil paints are very resistant to water, a plus for areas close to the sink. But because oil paint is invariably shiny, many home owners and kitchen decorators use it for cabinets, woodwork, and doors. As for color, yellow is a cheerful, welcoming color that is believed to spark the appetite. Red is believed to do this, too. No matter how you decide to repaint your kitchen, make sure you get a consultation first from Ireland’s Finest Painting Company before you start your work: 303-512-8777.